Home > Essential Info > Living in France > Festivals in France - celebrate the Languedoc-Roussillon way! The Languedoc-Roussillon (Languedoc-Roussillon Property Guide) region of France is a wonderful region in which to find and enjoy traditional French fun. Just about every village, even the tiny ones, host at least one festival or village fete every year, with many hosting what seems to be hundreds! This traditional way of life is a big part of what we love about France, and one of the main reasons why we come to live or holiday here. It's an old fashioned kind of fun... family friendly, good humoured and totally enjoyable. The larger towns of the region host some fantastic festivals, on a very diverse scale. Some of these correspond to events that take place all over the country, rather than being region specific, like the well known Bastille Day celebrations of July 14th. Every town has its own take on this festival, but many involve spectacular firework displays, street parties and music. One of the best of these is held in Carcassonne (Carcassonne Property Guide) where thousands gather to see the incredible sight of the fireworks bursting into the night sky and illuminating the fairytale splendour of the walled cité. Narbonne too (Narbonne Property Guide), goes to town on Bastille Day, making it the excuse for a massive four-day long party. Other than Bastille Day and countrywide events, the Languedoc offers up a feast of cultural events, parties and celebrations throughout all its departments and throughout the year. The selection that follows is just that, a selection, and there are many wonderful events that are not listed here, but hopefully it will give a taste of the sort of festivals that are found in this region. Carcassonne in the Aude (Aude Property Guide), is everybody's favourite city, with its magical old town, perched high on a hill and surrounded by towering walls. It holds a full programme of festivals, but one of the most celebrated is the summer music festival. Top name bands and solo artists are booked to perform at various venues around the old and "new" parts of the city, and free concerts also take place which generate a fantastic atmosphere. The festival lasts from June to August, and covers all genres of music from opera to heavy rock. Les Joutes Nautiques de Sète in Hérault (Hérault Property Guide) is an unforgettable event. Taking place on the Canal du Midi, the four-day festival involves canal jousting, which is a highly entertaining competition entailing teams of professional jousters trying to knock each other off special perched platforms into the waiting waters of the famous waterway. Played out in traditional costume, the festival attracts thousands of spectators and really is one to catch. The beautiful old city of Nîmes (Nîmes Property Guide) in the Gard department (Gard Property Guide), with its Roman history and heritage, is home to another acclaimed festival. The Pentecost Feria of Nîmes is the big event here, and it all happens every year around the feast of Pentecost. The Pentecost Feria lasts for a full five days, during which time there are bullfights, street parties, music, dancing and general craziness. The Dance Festival of Montpellier (Montpellier Property Guide) in the Hérault is definitely one worth putting in the diary. This one runs for a three-week period in late June and early July, and offers up a feast of traditional dance from all over the world. 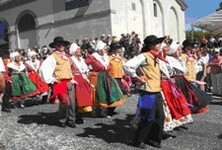 This Langogne festival in the Lozère department (Lozère Property Guide) is one for fans of folk music, as the town gives itself up to enjoying this traditional form of popular music for a whole week of tuneful fun and frolics. Le Grau du Roi in the Gard has a typically Camarguaise festival in September, where you can see the beautiful Camargue horses working in the traditional way, herding bulls through the streets. Not such a huge event, but definitely one that captures the flavour of the department, the Olive Fete in Canet en Roussillon (Canet en Roussillon Property Guide) in Pyrénées-Orientales (Pyrénées-Orientales Property Guide) is a lovely day. Usually held in early June, the festival sees costume parades, street markets and a chance to sample the produce from local olive farmers and oil mills. If you love festivals, there can be no better place to live than Limoux (Limoux Property Guide) in the Aude, the original party town of the region. 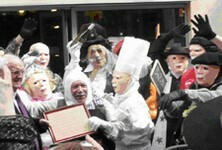 The winter festival lasts from January to April, with all manner of events taking place. There is always something happening in this fabulous little town. Ceret (Ceret Property Guide) is known as the town of cherries, and it comes as no surprise that it holds its main event in honour of this delicious early summer fruit. Béziers (Béziers Property Guide) in the Hérault is a wine town, surrounded by and dependant on its vineyards for generations. The wine festival of the Vins Primeurs d'Oc is a great event, and refreshingly provides something fun to do in October, just when you thought the best of the summer fun was over. The gorgeous fishing village of Collioure in Pyrénées-Orientales has plenty of festivals to choose from, held pretty much in every month of the year, but the main one and the one to head for in August is the Saint Vincent Festival. Spending time in Collioure (Collioure Property Guide) is never less than a delight, but during this festival the pleasure is doubled as visitors from all over Europe flock to this prettiest part of the Catalan coast to enjoy bullfighting, street markets, live music, Catalan dancing, local food and wine and more. The king of the cassoulet (a traditional dish of duck, sausage, white beans and duck fat), Castelnaudary (Castelnaudary Property Guide) in Aude, has a massive week-long festival to celebrate its most famous dish. The end of August is the time to get along to this charming old town on the Canal du Midi to take part in the festivities which include canal sports, live bands, dancing and discos, street entertainers and of course, eating cassoulet at long trestle tables in a tented village that takes over the whole of the main street. Side events have been known to include such oddities as a coach trip to see a field of the white haricot beans used for cassoulet... but I'm not sure how many takers there were for that one! Above should give some idea of the larger and most important fetes and festivals in the Languedoc, but don't forget that every small village has its own fetes and parties. Even the least assuming of these often offer some sort of activity, perhaps a Petanque tournament or a rugby match against a rival village, followed by a night of feasting and merriment in the village square or Salles des Fetes if the weather isn't good. Village fetes are a fantastic way to get to know the people who live in your village, make yourself known to the Maire, and to generally take part in the real French life that you came to find. Offering to help by becoming part of the "committee des fetes", which does all the hard work of organising the events, is also highly recommended. By now, you should have realised that the Languedoc is always looking for an excuse to have a party! In addition to the ones named above, excuses for festivals and general merrymaking include pigs, truffles, sardines, saints, church bells, horses, goose fat, teddy bears, beer, bicycles and extreme sports! It seems that if you fancy a good old knees up, just name something new to celebrate... that's if you can find an empty slot in the social calendar, which might be harder than you think.